Define who is responsible for the project and make for example searching for projects easier. A project manager is responsible for the project and make for example searching for projects easier. A project manager can be assigned to each project. The project manager is in full charge of the project. Assigning and changing the project manager is done in the project's basic information. 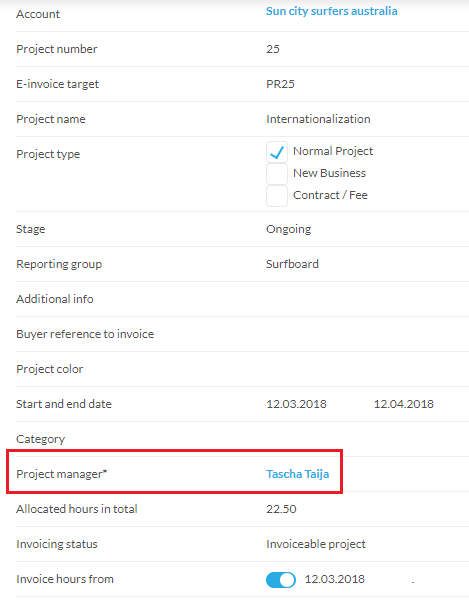 Taimer automatically assign the person who creates (and sets the status to Ongoing) the project as the project manager. The project manager can be changed in the project basic information anytime. This can be done for projects with statuses of Offered, Lead, Hold and Ongoing.